Revenue leaks are dollars that are either not being collected at all, or are not being collected as efficiently or effectively as they should be. We identified three key areas that account for the majority of lost revenue and some tools you can use to identify and plug the leaks. By putting a few simple steps in place during your scheduling or registration process, it will prevent many of your denials and rejections and lead to a better patient experience. It is much more efficient to resolve these issues on the front end than after services have already been rendered. Likewise, rethinking your back-end processes will help you prevent denials and rejections and increase your cash flow. 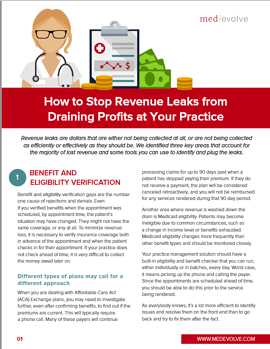 Download this article to learn how to stop revenue leaks from draining your practice's profits!